> Roots & Flowers: Sprout Something! Well, today I want to share a way to get a little growing action in your kitchen - Sprouts! Sprouting seeds are treasure troves of nutrition and have been grown by civilizations around the world for more than 5,000 years. Sprouts are considered to be one of the world’s “Super foods” because of their remarkable nutritional content. All natural edible sprouts from organic sprouting seeds offer both flavor and nutrients for culinary dishes throughout the world and have become a staple for many worldwide diets. 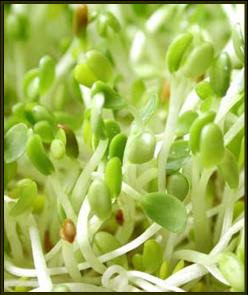 They are easy to grow, economical, and one pound of sprouting seed can usually generate about five pounds of sprouts! Sprouting your own seeds can be done all year long - in the winter, summer, spring or fall with just a nice spot in front of your favorite window. One great benefit of sprouting seeds is that anyone can do it! You may grow your sprouts from start to finish on the kitchen counter with just the light they get from around the room or a little indirect sunlight. Contrary to popular belief, when growing sprouts, room light is nothing to worry about. Sprouts can't begin photosynthesis until they have leaves. Not only is sprouting your own seeds a lot of fun but there many advantages of sprouting ones own seeds. Increases in protein quality, fiber content, essential fatty acids, and vitamin content are just a few of the amazing nutritional changes that occur upon germination. I get my sprouting seeds from Mountain Rose Herbs because they are guaranteed certified organic and Kosher certified. Sprouting times for different varieties of seeds will vary. Below is a list of some of the most common sprouting seeds and typical amount of time to yummy sprouts. Of course, tasting along the way will help you determine when your sprouts taste best. This had better be WICKED easy, because I kill green things. I even killed a cactus once. True story. LOL! It is SO easy. My kids do it by themselves now. last night my 12 yr old ate a huge bowl of sprouted lentils w/ grated cabbage and carrot. She sproute dthe lentils herself, which is what inspired her to eat them. Lentils are probably the easiest to start with. Great post! Sprouting is really easy once you get the hang of it. The video you posted is good for walking someone through it. I love being able to fresh sprouts in the winter. Clover are probably my favorite. Wow! THX for posting this. I'm going to start mine right away - didn't know it this easy to do in the winter! OK, this was a good video for someone like me just starting out. My family in Germany grows sprouts in jars, it looks easy and I am not sure why I didn't try it sooner. I love sprouts, too! Will give it a try. And I like the looks of Mt Rose herbs!